Thank you for the work you do for Hopkinton! We love what you do, and we want to help broaden your connection to our community. So what can HCAM do for you? 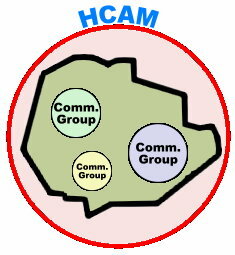 Every Community Group has a unique mission, and HCAM can help you share that mission with the community. 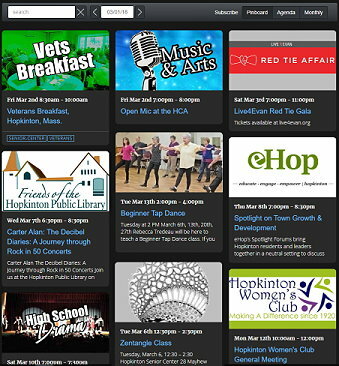 Our passion happens to be bringing information to Hopkinton residents to inform, educate, and entertain them. Every day. Within Hopkinton, you have dedicated fans and followers: people who align with your mission so closely that they are always well informed of your activities. And there are others who may be interested in your events, but are not aware of them. The sphere of influence we target is every person in Hopkinton, as our goal is simply to connect everyone to information. 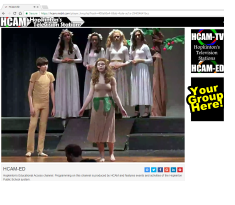 HCAM-TV and HCAM-ED, our stations. 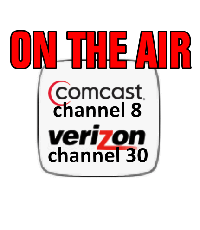 We are in 5,328 Hopkinton households, and in other towns on Verizon as well (Holliston, Milford, Ashland, Franklin). Okay, enough credibility-building, what can HCAM do for you? We welcome information from your group; event flyers, meeting agendas, forum announcements, etc. 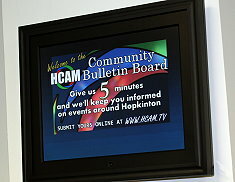 These go on our HCAM-TV Community Bulletin Board, and online. In partnership with the Community Communications Committee, HCAM is powering a Community Calendar, designed to be easy, useful, and attractive. All information is welcome there, and as a Community Groups Member, your posts can have graphics to really make your message pop (posted by either you or our staff). You can even embed the mini-calendar on your website (like on the homepage of hcam.tv), giving your visitors timely info, just like us! This takes our Community Bulletin Board to the next level. First, we give your message the star treatment, adding color, fonts, graphics and photos, really making your content stand out. Then we put it on a schedule to pass through our multimedia empire sequentially (Community Bulletin Board, Digital Screens, Calendar, Facebook, newsfeed, Twitter). This will give our viewers several exposures to your content. We have a few digital screens in the community (Town Hall, Library, Bill’s Pizza) and we are dedicating a fair amount of space there to promoting our Community Group Members. This is a place to have general information about what you do and how to contact you, raising your visibility. The page hcam.tv/locallinks hosts a listing of community groups, and for our members we offer to produce a short introductory video embedded with the text description, to give a face to who you are. Looking to host a community meeting, forum, or event? Consider our Studio A. We have 800 square feet and a capacity of 75 people (Need more? We have overflow in Studio B). And if you wish a quieter setting without all the TV cameras and lights of a full blown television production, we can handle that too. We can use robotic cameras for a less-intrusive presence, or even not record the event if you so desire. We have installed new house lighting for a softer ambiance. We’re also adding to our decor to make it more friendly, and will be creating a relationship with local vendors for light refreshments for your event. Once you are here, the level of the event is up to you. We can do a full show or stage a simple space, record the event, send it out live, have viewer email/call-ins, or even format it as a webinar on our website. As part of our online channels (HCAM-TV and ED) we have space for sponsorships, and have dedicated one of those spots on a rotating basis for our Community Group Members. As a member of HCAM, you have the opportunity to have us produce videos for you. 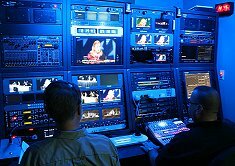 You’re thinking we do that already, I know, but everything we produce airs on HCAM-TV (we are a TV station, after all). With NPO Productions you can have us record training sessions, knowledge transfers from retiring members, and other programs that do not air on our channel. This is a resource for your organization, and comes at minimal cost. Sound good? What’s the next step? Now it’s time to Connect to HCAM. Does your organization have a person to do publicity and community awareness? Great, we can give them access to our empire so that they can post photos, press releases, stories, and calendar events. If your group doesn’t have a dedicated person in this role, you can provide us anything you wish and our staff will get it posted for you. If you're ready, sign up below and we'll be in touch! Or ask me your questions. Oh, and...Welcome to HCAM!